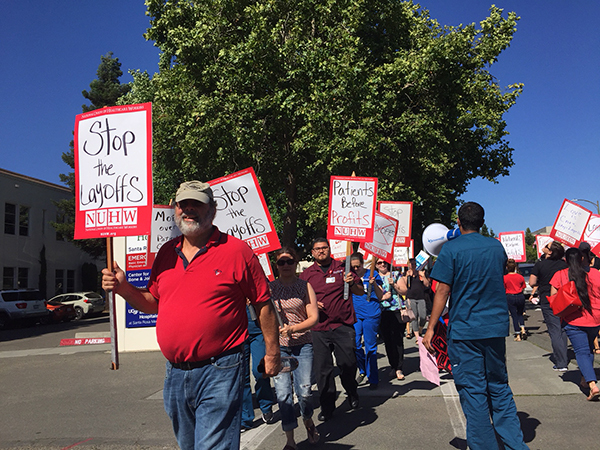 More than 200 people picketed outside Santa Rosa Memorial Hospital Friday calling on the hospital to rescind layoffs to dozens of caregivers who worked around the clock in the aftermath of last year’s fires. Chanting “What do we want? 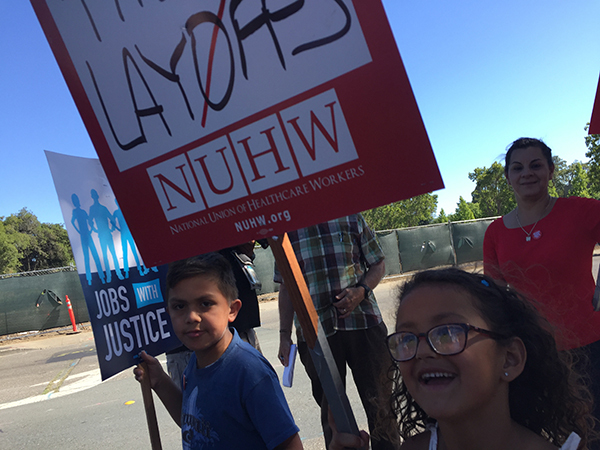 No layoffs!,” workers and supporters questioned why the hospital would be laying off frontline caregivers, including at least 25 nursing assistants, after reporting a $55 million profit last year. 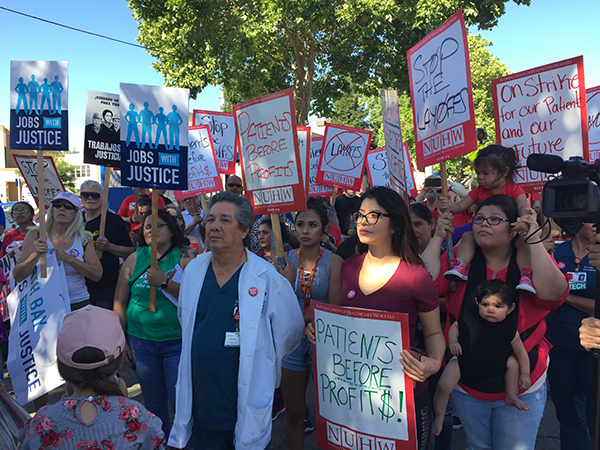 “Management should be putting that money toward improving patient care in our community — instead they’re hoarding profits and eliminating caregivers,” said Ruben Valdez, a 41-year-old nursing assistant who marched with his three children just two days before he was scheduled to lose his job. Santa Rosa Memorial, which is Sonoma County’s designated trauma center, announced in May that it would be laying off 55 workers, including 28 nursing assistants and the only technician trained to set broken bones. Many of those getting pink slips worked at the hospital every day during last year’s fatal wildfires even after being evacuated from their homes. Memorial CEO Todd Salnas wrote to workers that the hospital “needs to operate in the most cost-effective way possible,” and tried to couch the layoffs as “a response to external pressures and market forces.” This belies the fact that Memorial is consistently profitable. After turning a $55 million profit in 2017, it made $11 million in the first three months of this year, according to reports it filed with the state. 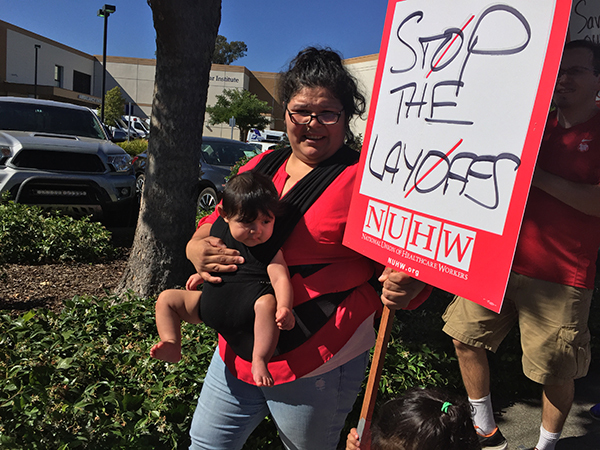 Jesarela Hernandez, who was on leave bonding with her newborn daughter when she learned that she would be losing her job, said she and her coworkers are still intent on getting the layoffs rescinded.